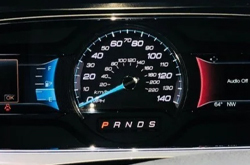 What's' New For the 2019 Ford Taurus? 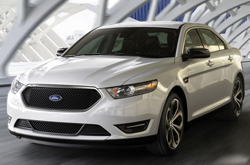 The Ford Taurus has historically been a solid choice in the family of mid-size sedans. With a roomy, comfortable interior and plenty of features for its price tag, the Taurus has always been a reliable vehicle and a good value. But this year, an exterior design change gives the Taurus a head-turning appearance too. Elegance is the name of the game this year with the sedan's aerodynamic shape, sculpted rear end, and dual exhaust system with chrome tips. The car's revision includes a wider stance, which also provides more cabin space, and a bolder front grille that makes it stand out. This year, the Taurus features a modernized interior with premium craftsmanship and evident attention to detail. More performance features make the Taurus more fun and efficient to drive, too. New for this year are bright and bold LED lights that give the Taurus a stylish look and also make it more visible. Inside, a variety of active safety features can make the difference between avoiding an accident or not. Soft-touch materials make the Taurus ultra comfortable, while a sophisticated design isolates engine noise to make your rides quieter. An array of amenities, which are either standard or available, include soft leather-trimmed seats, plush seat cushions, and wood grain accents for a classy interior finish. In 2019, the Taurus is available in four trims. The base model, called the SE, gets the Taurus off to a strong start with a variety of impressive features. Standard on this model are a single-zone climate control, three grab handles, and a spacious front center console with a removable tray and multiple cup holders. 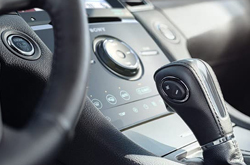 A chrome-accented shift knob gives the SE interior an upscale look, while a keyless remote entry system makes accessing your Taurus easier than ever. With the second trim level, called the SEL, you'll get a dual-zone air conditioning system and more leather in the interior, including on the shift knob and the steering wheel. Along with remote access, this trim level comes with a push-button start. An external temperature display helps you prepare for the day, and the infotainment system adds a choice of satellite radio to the audio mix. The third trim level is the Limited. Sharper, bolder sound comes from the upgraded Sony sound system. The SHO's leather steering wheel has wood trim accents for a more elegant appearance. The wheel is also heated. Heated seats are standard in both rows, and the front seats are cooled as well. Split-folding seats in the back maximize space for more cargo or passenger room as needed. The highest trim level is the SHO. This trim level has power-adjustable aluminum pedals for a sportier driving feel. 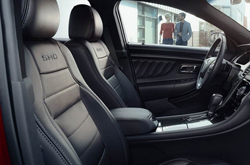 It also has custom leather seats, more standard safety amenities, and an interior accented with SHO graphics. How Well does the 2019 Taurus Perform? All four trim levels have the same engine, which is a 3.5L, V6 engine that has variable valve technology. This engine produces substantial horsepower (365) at 5,500 RPM. It runs on standard gasoline. The next two trim levels have an identical engine, but it has a flexible fuel option. With the flexible fuel engine, you'll get a maximum of 288 HP. All engines are mated to a shiftable automatic transmission with six speeds. The fact that the Taurus gets a five-star crash test rating is impressive to begin with, but you'll be even more impressed when you learn what it offers. Sophisticated technology detects collisions before they happen and applies the brakes if they're unavoidable. An audible and visual warning alerts you of cars in your blind spots, and sensors help you reverse with ease. A LATCH child seat security system, tire pressure monitoring system, and electronic stability control are other safety components. The 2019 Ford Taurus must be experienced in person and the way to do that is visit our dealership in Peoria, AZ and take a test drive.